Congratulations to the 2018 LRSEF Winners Anna and Naomi! Congratulations to the 2018 Lowcountry Regional Science and Engineering Fair Winners: Senior 2 Winner Anna Smirnova from Academic Magnet High School (teacher Katy Metzner-Roop) and Senior 1 Winner Naomi Higgins from The Georgetown School of Arts and Sciences (teacher Michelle Neubauer)! 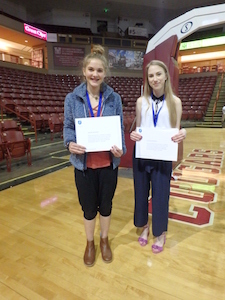 With their research, Anna and Naomi each won their particular division of the Lowcountry Regional Science and Engineering Fair, held in April at the College of Charleston and presented at the Intel International Science and Engineering Fair (ISEF), this May in Pittsburgh, PA. 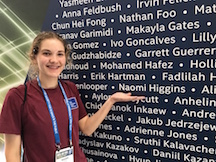 The LHSM was proud to have both of these students represent the Lowcountry of South Carolina at the Intel ISEF. Anna’s research focused on how Phenyl-C61-butyric acid methyl ester (PCBM) affects the phase dynamics of the polymer in solution, to see if it might provide an additional nucleation site and increase aggregation and alter the final film morphology of the spin-coated solution. Naomi’s research tried to determine if music or sounds are motivational and improve concentration, or if they were distracting, while performing some type of math task. Anna is currently a senior at Academic Magnet High School, Charleston, SC. This summer She’ll be working in the physical chemistry lab with Dr. Boucher at the College of Charleston. Next year She’ll be studying chemistry at Duke University. In the future, she hopes to use the principles of physics and chemistry to make the world a better place, specifically in the energy and environment sector. After college, she hopes to get a Ph.D. in molecular engineering, physical chemistry, or a related field, and possibly work for the Department of Energy or maybe run her own lab at a university. Naomi will be a Sophomore at The Georgetown School of Art and Sciences, Georgetown, SC. She is still not quite sure what the future holds for her, but she knows that she is interested in continuing her research around music and the effects it has on people. 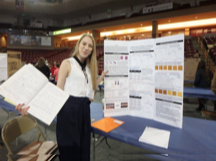 As the Intel ISEF says…the future is indeed bright for these science fair participants. And it is indeed bright for our own Anna Smirnova and Naomi Higgins!